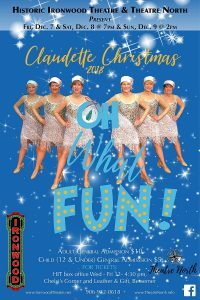 The Claudettes “Oh, What Fun!”— Once again the Claudettes are kicking off the holiday season with a Christmas Extravaganza. Singers, dancers, choirs and bands join the Claudettes for a celebration of holiday cheer. Santa and Mrs. Claus create some holiday magic which delights young and old alike. This show is a collaboration between Theatre North, The Historic Ironwood Theatre (HIT) and The Claudettes. Three-show extravaganza, not to be missed. Tickets available soon.